Laaadies and gents! Let me tell you about THE party of the summer! Yep, there's a party at The League, and you're invited! :D It will consist of a few of my favorite things: food, a challenging workout, and music that will have you dancing when you hear "burpees"! All with my favorite FITFAM. 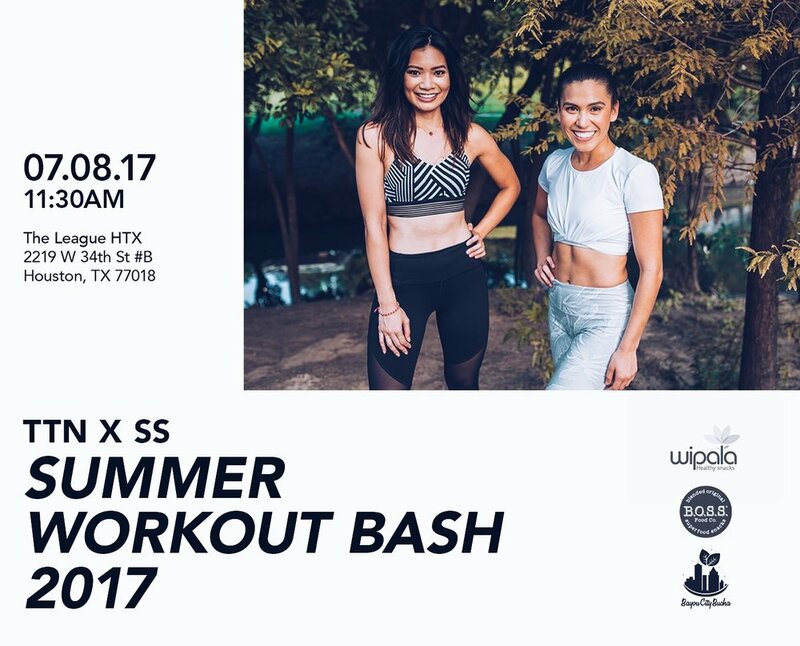 To The Nines (TTN) and Starla Garcia, local dietitian and creator of the Sweat x Shine (SS) health and fitness blog, are bringing you #TTNxSSSummerBash! An AWESOME workout at The League gym. They know how to whoop that booty in shape. The head instructor, Terry, designs their PAC(K) Training classes with a combination of strength training and conditioning exercises using his experience in training professional athletes and education in Health and Human Performance. No workout is the same. He will be leading the workout on Saturday, so you won't want to miss it! Come train like an athlete! Simple yet functional bars created by Andrea of B.O.S.S. Food Co. bars in Houston. Wipala's bars are made with quinoa and superfoods from Ecuador. Michele's Granola is handmade in small batches for consistent flavor. LifeAID supplemental beverages are made without caffeine, sugar, and additives. You will get to do some good, too! Bring a pair of old training shoes to donate to the homeless, and your name will be entered to win prizes, like gift cards towards new kicks or exercise essentials from Fleet Feet Houston and treats! We will also have some talented eyes, Misun Photography, snapping photos of you in action. Tickets are only $5 (cash only the day of the event). Doors open at 11:00 a.m., so be ready to sweat at 11:30 a.m.! Come hang out with us! R.S.V.P. at our Facebook event page or R.S.V.P. and purchase tickets at our Eventbrite page! We are excited to meet and share our favorites to a healthy lifestyle with YOU!